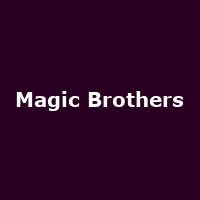 The Magic Brothers are drummer Daniel "Woody" Woodgate (from Madness) and his brother Nick. "Wonderfully crafted pop songs like 'You Don't Have To Hide Your Love Away' and 'Do What You Wanna Do' recall artists as diverse as The Colourfield, Dusty Springfield and Elvis Costello, and certainly wont disappoint fans of Woody's other superfine pop act Voice Of The Beehive. Beautifully orchestrated but still gritty and dance friendly and certainly not to be missed." Their debut album "In Your Mind" will be released in 2014.